This weekend in my local supermarket I discovered and bought a packet of Snakeshead Fritillary bulbs, which I plan to plant next weekend in the hope that come springtime my garden will look like Magdalen College meadow! Snakeshead Fritillary (Fritillaria meleagris) is the county flower for Oxfordshire, due to their abundance in Magdalen College Meadow and the village of Ducklington which even has a Fritillary festival! 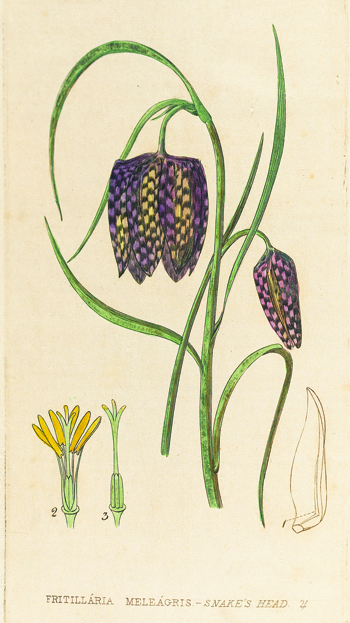 The flowers are quite unusual with a chequered pattern and come in purple or white, as illustrated here in an image from 'British Flowering Plants’ by William Baxter who was Curator of the University of Oxford Botanic Garden from 1813-1843.